When I’m asked to bring a side dish to a party, potluck, or cookout, I almost always go with pasta salads. They’re quick + simple to make, they appeal to kiddos and adults alike, and they’re very forgiving temperature-wise, being equally awesome cold straight from the fridge or at room temperature. So, when I recently saw a recipe for a delicious-sounding lemony Tortellini-Chickpea Pasta Salad and was having a big group over to my house for a potluck dinner the following day, I knew that I had to give it a try. I love pasta, I looooove lemon, + I love fresh veggies, so I sensed that I was going to be a huge fan of this salad. And the verdict from myself and my guests? This pasta salad is SO delicious. Truly, this might be the best pasta salad I’ve ever made! 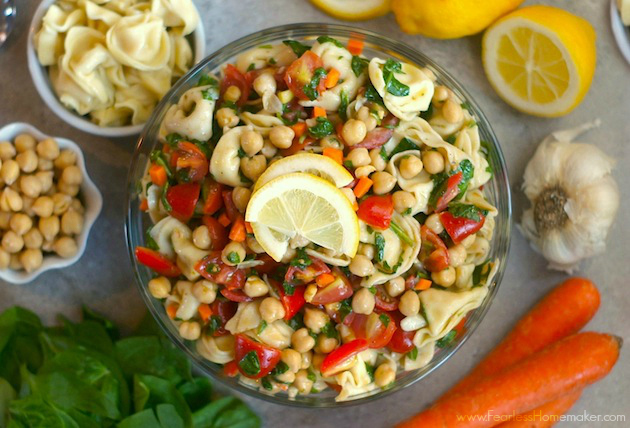 There’s tasty cheese tortellini, hearty chickpeas, + bright, crisp vegetables (carrots, spinach + tomatoes), all tossed with an amazingly wonderful homemade lemon, herb + garlic vinaigrette. (Note: the super-simple-to-make vinaigrette is also fantastic for dressing green salads!) Including all chopping, prepping, + cooking, this only took me about 30 minutes to make, which was much appreciated by this busy mama. As printed below, this recipe serves 4-6 people as a side dish, but it’s easily doubled or even tripled (which is what I did) if you’re serving a bigger group. So, now that the season of warm-weather parties is approaching, make sure you bookmark this recipe to try – I promise, you and your cookout companions are going to love it! Bring a large pot of salted water to a boil + cook tortellini according to package directions, until al dente. Drain and set aside. In a small bowl, make the vinaigrette – combine the vinegar, lemon juice, garlic, oregano, and salt and pepper to taste. Whisk until combined. Add the olive oil and whisk again to emulsify. 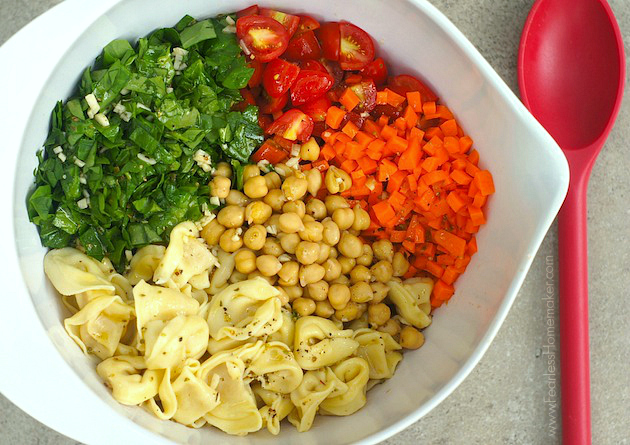 In a large bowl, combined the cooked tortellini, chickpeas, chopped spinach, tomatoes, and carrots. Pour the vinagrette over the salad and toss gently to combine well. Taste and add more salt/pepper if needed. Serve either chilled, or at room temperature. This really does sound delicious! Just the perfect thing for a summer lunch. This salad looks perfect for the spring and summer – so fresh, vibrant, and healthy! YUMM! That looks perfect for the warmer weather – I love pasta / veggie salads, what a great combination of ingredients! Ok now I’m really hungry. Is it lunch time yet? It’s been so long since I’ve made a pasta salad and this looks perfect! Time to plan a picnic/bbq party. i need to try this, asap. it sounds amazing. my favorite pasta salad has lemon and asparagus and tomatoes in it. this sounds like an amped up version of that! yum! Sold – I need this ASAP! Anything with chickpeas is a winner in my book. AH! I LOVE THIS! No seriously, I am a huge pasta salad fan and I love the idea of using tortellini instead. How did I never think of this?? Oh wow! This looks so springy and delicious. I must add this salad to my repertoire. It sounds – and looks – fantastic! I love chickpeas and always looking for some new recipes with them. This sounds tasty! I’m the biggest fan of chickpeas here, but I never made a salad like yours. Looks so delicious and easy to make. Thanks for another awesome recipe to my collaction! 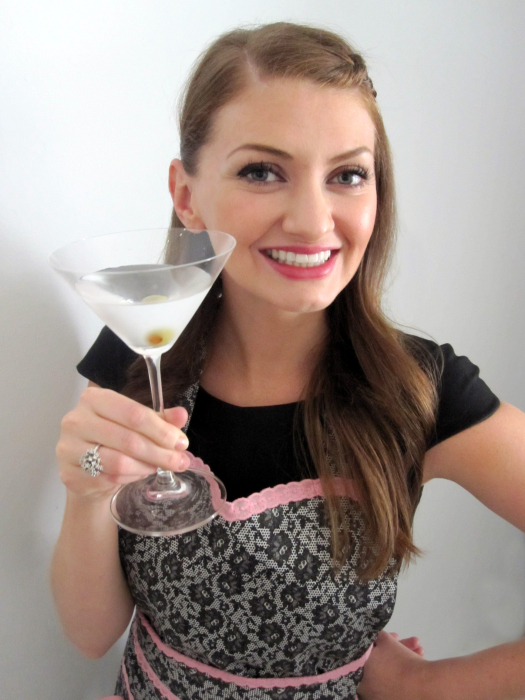 This looks incredible, Amy! With all the summer parties and potlucks coming soon, I am always looking for a winning dish to bring so I can’t wait to try this! Love the chickpeas in here and the vinaigrette sounds so refreshing and delicious! 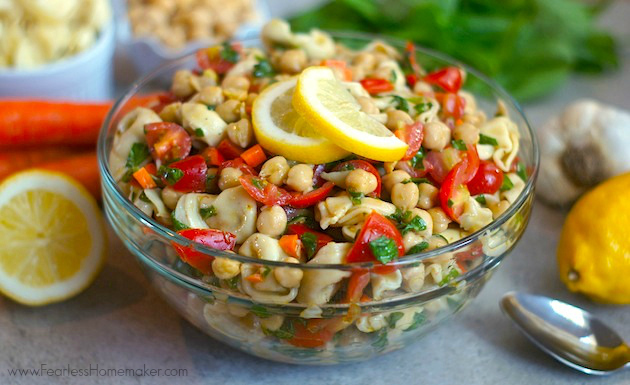 This looks colourful and healthy…chickpeas in salads are my favourite.